Diesel exhaust fluid or AdBlue is an aqueous solution produced by using urea and deionized water with volume percentages of 32.5 percent and 67.5 percent respectively. It is a fluid used in the treatment of harmful nitrogen oxide (NOX) emissions from diesel motor, through a selective catalyst (SCR) process to decompose nitric oxide into Nitrogen and Water. EF vaporizes and decomposes in the exhaust pipe into ammonia and carbon dioxide which reacts to a catalyst of selective catalyst reduction (SCR) in the vehicle with oxygen and harmful nitrogen oxides. As a result, nitrogen, water vapor and carbon dioxide are produced.DEF is directly related to the temperature at which the DEF is stored and is therefore used to maintain its quality with special storage tanks composed of polyethylene or stainless steel. 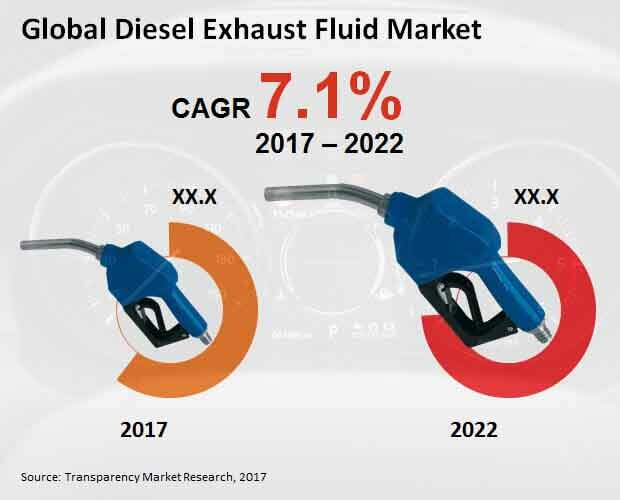 A comprehensive market study with focus on its drivers, restrictions, trends and opportunities is provided by the report on the global exhaust diesel liquid market. The report also examines the impact of the product on related sectors and industries. The global reports provide an insight into the various strategies existing market vendors can undertake with a view to attracting new players to the industry, along with an analysis of entry obstacles. The report acts as a comprehensive guide on the global market for diesel exhaust fluid over the mentioned period of forecast. According to TMR analysts, the global diesel exhaust fluid market is anticipated to generate value of US$14.4 bn by the end of forecast period in 2022. In 2017, the market earned US$10.4 bn. The market is likely to progress at healthy growth rate of 7.4% between 2017 and 2022. The global market for diesel exhaust fluids is classified by packaging size, type of vehicle, package size, and equipment solution. For the packaging sector, demand will rise significantly over the coming years in the bottles segment (1 and 2,5 gallons). Because of the diversity of usability and increased use of these bottles, these bottles are very popular. The market is divided into cars, mobile and static vehicles, mobile cranes, agricultural machinery, building equipment, tractors, cranes, mining machinery, dumps, and others, according to vehicles type. The market is also divided into box delivery trucks, certified pumps, nozzles, hoses, mini-voltage systems, cars, tank cars and bulk cars within the category of solution equipment. With regard to geography, the key regions covered by the global exhaust fluid market are North America, Asia Pacific, Latin America, Europe, and the Middle East and Africa. Europe held its highest share of these regions in 2017. In North America, developed countries are also expected to fuel demand for diesel exhaust fluid with several government policies that promote the environment and an immense presence of giants of industry. Asia Pacific, on the other hand, is expected to hold the dominant share over the forecast period of the global diesel exhaust fluid market, excluding Japan. There is a huge popularity with diesel power cars and the demand for diesel exhaust fluid has increased further. Leading vendors operating in the global diesel exhaust fluid market are Royal Dutch Shell Plc, Yara International ASA, Total SA, Valvoline, and SINOPEC. Diesel exhaust fluids are a key component of diesel engines due to the benefit they provide in terms of reducing the polluting content of the exhaust. Rising environmental concerns have driven the adoption of innovations such as diesel exhaust fluids and are likely to propel the global diesel exhaust fluid market at a robust rate in the coming years. It is a 32.5% solution of urea in deionized water and allows diesel engines to convert the abundant nitrogen oxides in their exhausts to harmless nitrogen and water. The global diesel exhaust fluid market has been driven by the exhaustive support being given to environmental conservation programs by a number of governments across the world, which has driven steady investment into the development of reliable diesel exhaust fluids. The report discusses the growth trajectory of the global diesel exhaust fluids market in detail by providing an assessment of the historical figures exhibited by the market between 2012 and 2017. The 2016 figures for the global diesel exhaust fluid market are analyzed in detail to derive reliable conclusions regarding how the market is likely to progress in the years till 2022. The segmentation of the global diesel exhaust fluid market as well as its competitive landscape are given a thorough examination in the report in order to provide readers with a clear view of the market’s dynamics and how they will affect disparate parts of the market. According to Transparency Market Research, the global diesel exhaust fluid market was valued at US$10,241.5 mn in 2017. Exhibiting a robust 7.1% CAGR between 2017 and 2022, the market’s valuation is expected to rise to US$14,445.5 mn over the forecast period. The prime factor driving the development of the global diesel exhaust fluid market is the growing government support to the widespread adoption of diesel exhaust fluid. Governments in several countries have come up with legislation to promote or even mandate the use of diesel exhaust fluids, leading to rapid growth of the diesel exhaust fluid market in several regions. The booming automotive industry is likely to be an important driver for the global diesel exhaust fluid market in the coming years. Growing demand from middle-class consumers has driven the global automotive industry at a steady rate in the last few years, with diesel cars becoming a key part of the product lineup of several car brands due to the higher fuel efficiency they provide. This is likely to drive the use of diesel exhaust fluid in many regions where the consumer vehicle industry has shown strong promise. By pack size, the global diesel exhaust fluid market is segmented into bottles, drums, and IBCs. Of these, diesel exhaust fluid bottles (1 and 2.5 gallons) are likely to dominate the global market in the coming years due to their widespread use and diverse usability. The bottles segment of the global diesel exhaust fluid market accounted for US$4,221.8 mn in 2017 and is likely to rise at a CAGR of 6.9% between 2017 and 2022. The segment’s share in the global diesel exhaust fluid market is, however, expected to drop from 41.2% in 2017 to 40.8% by 2022. Geographically, the global diesel exhaust fluid market is significantly fragmented, as North America, Europe, and Asia Pacific all hold dominant shares and are likely to retain a steady dominance in the coming years. Leading players in the global diesel exhaust fluid market include Yara International ASA, Total SA, SINOPEC, Cummins, CF International Holdings Inc., Valvoline, Royal Dutch Shell Plc, RelaDyne LLC, and GreenChem Solutions Ltd.